New Sonic Arts released version 1.5 of its Nuance sampler, which is available for a special discounted price until the end of the month. VSL announces the update of its free Vienna Instruments sample player, which now allows for using the MIRx reverb extensions. Glitchmachines announces the release of update v1.1 for its Polygon quad sampler. We had the privilege to get a special presentation of the long-awaited SampleTank 3 by the IK Multimedia team at NAMM Show 2014. A typhoon is about to blow your home studio away, or better said, the reproduction of the Typhoon launched 14 years ago for the Yamaha TX16W sampler. 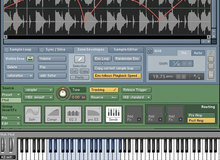 Steinberg released a 30-day trial version of its HALion 5 virtual sampler.